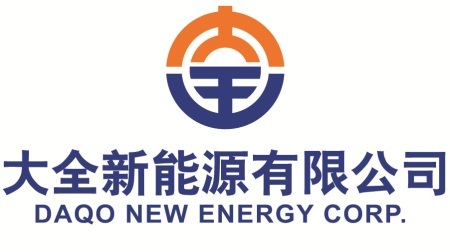 CHONGQING, China—November 14, 2011—Daqo New Energy Corp. (NYSE: DQ) (“Daqo New Energy”or the “Company”), a leading polysilicon manufacturer based in China, today announced its unaudited financial results for the third quarter ended September 30, 2011. Polysilicon shipments were approximately 1,022 metric tons, or MT. Photovoltaic (PV) module shipments were 1.9 Mega watts, or MW. In addition, the Company provided 9.4 MW PV modules manufacturing outsourcing service to its customers. Wafer shipments were 6.5 MW. Revenues were $59.6 million, compared with $70.7 million in the second quarter of 2011 and $63.2 million in the third quarter of 2010. Gross profit was $19.9 million, compared with $33.0 million in the second quarter of 2011 and $26.9 million in the third quarter of 2010. Gross margin was 33.3%, compared with 46.6% in the second quarter of 2011 and 42.5% in the third quarter of 2010. Operating income was $17.1 million, compared with $32.6 million in the second quarter of 2011 and $24.0 million in the third quarter of 2010. Operating margin was 28.8%, compared with 46.2% in the second quarter of 2011 and 38.0% in the third quarter of 2010. Net income attributable to Daqo New Energy Corp. shareholders was $12.1million, compared with $25.7 million in the second quarter of 2011 and $17.7 million in the third quarter of 2010. Earnings per fully diluted ADS were $0.34, compared with $0.73 in the second quarter of 2011, and $0.65 in the third quarter of 2010. Revenues were $59.6 million, compared to $70.7 million in the second quarter of 2011 and $63.2 million in the third quarter of 2010.The change was primarily attributable to revenues generated from sales of polysilicon. The Company generated revenues of $53.0 million from 1,022 MT polysilicon sold, compared to revenues of $63.0 million for 1,001 MT of polysilicon sold in the second quarter of 2011, and revenues of $55.2 million for 973 MT of polysilicon sold in the third quarter of 2010. The shipment volume of polysilicon in the third quarter of 2011 increased by 2.1% and 5.0% compared to that in the second quarter of 2011 and the third quarter of 2010, respectively. The difference in revenues from polysilicon sold was primarily due to a relatively lower average selling price of the polysilicon in the third quarter of 2011. In the third quarter of 2011, the Company also generated $0.7 million, $2.8 million and $3.0 million for module processing service fee, sales of PV modules and sales of wafers, respectively. Gross profit was $19.9 million, compared to $33.0 million in the second quarter of 2011 and $26.9 million in the third quarter of 2010. Gross margin was 33.3%, compared to 46.6% in the second quarter of 2011 and 42.5% in the third quarter of 2010. The fluctuation from the second quarter of 2011 and the third quarter 2010 in gross profit and gross margin was primarily due to the lower average selling price of the polysilicon product combined with the impact of inventory charge in the third quarter of 2011. The total inventory write-down for wafer and modules in the third quarter of 2011 was due to lower of cost or market valuation (LCM) amounted to $3.7 million. Selling, general and administrative expenses were $4.3 million in the third quarter of 2011, compared to $3.9 million in second quarter of 2011 and $2.7 million in the third quarter of 2010. The increase of $0.4 million in this quarter from that of the second quarter of 2011 was primarily due to operating expense associated with Xinjiang expansion project. The increase of $1.6 million in this quarter from that of the third quarter of 2010 was primarily due to the operating expense associated with Xinjiang expansion project. Research and development expense was $152 thousand in the third quarter of 2011, compared to $165 thousand in the second quarter of 2011 and $318 thousand in the third quarter of 2010. Other operating income $1.8 million in the third quarter of 2011, compared to $3.8 million in the second quarter of 2011 and $131 thousand in the third quarter of 2010. Other operating income mainly composed of unrestricted cash incentives that the Company received from local government authorities, which contributed the fluctuations from period to period. As a result of foregoing, operating income in the third quarter of 2011 was $17.1 million, compared to $32.6 million in the second quarter of 2011 and $24.0 million in the third quarter of 2010. Operating margin was 28.8%, compared to 46.2% in the second quarter of 2011 and 38.0% in the third quarter of 2010. Net interest expense in the third quarter of 2011 was $1.9 million, compared to $1.7 million in the second quarter of 2011 and $2.3 million in the third quarter of 2010. Income tax expense in the third quarter of 2011 was $2.9 million, compared to $4.5 million in the second quarter of 2011 and $3.0 million in the third quarter of 2010. The change from the second quarter of 2011 and the third quarter of 2010 was primarily due to the lower income before tax in the third quarter of 2011 combined with $970 thousand valuation allowence of deferred tax assets of modules business in the third quarter of 2011. As a result of the aforementioned, net income attributable to Daqo New Energy Corp. shareholders was $12.1million, compared with $25.7 million in the second quarter of 2011 and $17.7 million in the third quarter of 2010. Net margin was 20.3% in the third quarter of 2011, compared to 36.3% in the second quarter of 2011 and 28.0% in the third quarter of 2010. As of September 30, 2011, Daqo New Energy Corp. had $66.8 million in cash and cash equivalents and restricted cash, compared with $147.5 million as of June 30, 2011. The change in cash position was primarily due to capital expenditures for business expansion in Xinjiang. As of September 30, 2011, the Company’s accounts receivable balance was $29.1 million, compared to $31.8 million as of June 30, 2011. As of September 30, 2011, total borrowings were $157.6 million, of which $63.1 million were long-term borrowings, compared to total borrowings of $162.7 million, including $67.8 million long-term borrowings as of June 30, 2011. For the fourth quarter of 2011, the Company plans to shut down the polysilicon production facility for approximately two weeks in December for periodical maintenance. For the fourth quarter of 2011, the Company expects to ship 800-850 MT of polysilicon. The company also expects to ship approximately 16 MW of wafer as well as 14 MW of modules. For the module shipment, the company further expects 8 MW will come from its brand name module and expects to provide 6 MW PV modules manufacturing outsourcing service to its customers. This outlook reflects our current and preliminary view and may be subject to change. Our ability to achieve this projection is subject to risks and uncertainties. See “Safe Harbor Statement” at the end of this press release. Daqo New Energy will host a conference call at 7:00 am, Eastern Standard Time on November 14, 2011, which is 8:00 pm, Beijing Time on November 14, 2011, to discuss the results for the quarter. Joining the call will be Dr. Gongda Yao, the Company’s Chief Executive Officer and Mr. Jimmy Lai, the Chief Financial Officer. This conference call will be broadcast live over the Internet and can be accessed on Daqo New Energy’s website at http://www.dqsolar.com. To listen to the live webcast, please go to Daqo New Energy’s website at least fifteen minutes prior to the start of the call to register, download and install any necessary audio software. This announcement contains forward-looking statements. These statements are made under the “safe harbor” provisions of the U.S. Private Securities Litigation Reform Act of 1995. These forward-looking statements can be identified by terminology such as “will”, “expects”, “anticipates”, “future”, “intends”, “plans”, “believes”, “estimates” and similar statements. Among other things, the outlook for the first quarter of 2011 and quotations from management in this announcement, as well as Daqo New Energy’s strategic and operational plans, contain forward-looking statements. The Company may also make written or oral for-ward-looking statements in its reports filed or furnished to the U.S. Securities and Exchange Commission, in its annual reports to shareholders, in press releases and other written materials and in oral statements made by its officers, directors or employees to third parties. Statements that are not historical facts, including statements about the Company’s beliefs and expectations, are forward-looking statements. Forward-looking statements involve inherent risks and uncertainties. A number of factors could cause actual results to differ materially from those contained in any forward-looking statement, including but not limited to the following: the demand for photovoltaic products and the development of photovoltaic technologies; global supply and demand for polysilicon; alternative technologies in cell manufacturing; our ability to significantly expand our polysilicon production capacity and output; the reduction in or elimination of government subsidies and economic incentives for solar energy applications; and our ability to successfully implement our vertical integration strategy. Further information regarding these and other risks is included in the reports or documents we have filed with, or furnished to, the Securities and Exchange Commission. Daqo New Energy does not undertake any obligation to update any forward-looking statement, except as required under applicable law. All information provided in this press release and in the attachments is as of the date of this press release, and Daqo New Energy undertakes no duty to update such information, except as required under applicable law.